There are two major benefits to knowing how to read your electric meter. The first benefit is that you’ll be able to save money and energy. If you’re financially conscious, reading your meter every month to compare numbers will help you determine if home improvements you made to your property are producing a return on investment. The second benefit is that you’ll be able to verify that the electric company is billing you correctly for the electricity you’ve used and make sure you weren’t overcharged due to an error. Utility company personnel use handheld computers to monitor and record your meter readings, but that doesn’t mean mistakes don’t happen. Standard procedure for the utility company is to get your meter reading and compare it to your last few readings. If the current reading is significantly higher or lower than past readings, the company sends someone back to your property to read your meter dials and make sure the reading is correct. This shows you that sometimes, mistakes happen. By reading your meter and comparing to your utility bill yourself, you can make 100% sure that your bill is completely accurate and you are not being overcharged. When you first look at your meter you will notice five dials in total. Each of the five dials represents one digit of the present reading. 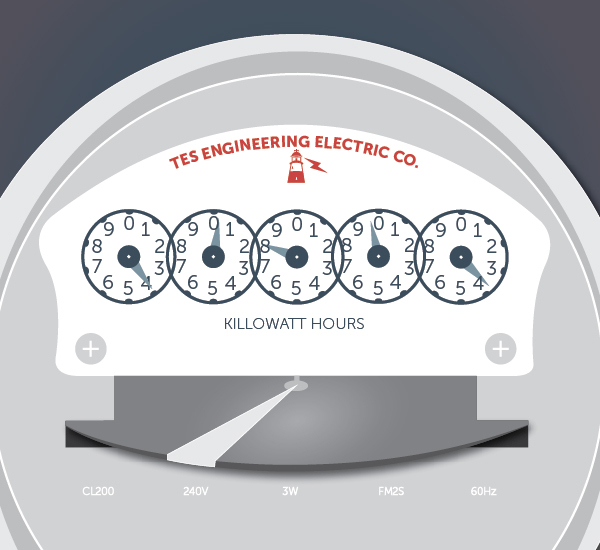 When electricity flows through the meter the dials begin to spin. Not all of the dials look the same. Some of them spin clockwise and some of them counter clockwise. When looking at the dials, if one of the hands is in between two numbers then it is safe to use the smaller number in the reading. Sometimes you cannot tell if the hand on the dial has passed a number or if it is still pointing to a certain number. The simple way to check is by looking at the dial to the right of the dial in question. If the dial to the right has already passed zero then the dial in question is correctly pointing to the right number for your reading. If the dial to the right has not passed zero yet, then it is safe use the next smallest number on the dial in question. Something to keep in mind is that when the utility company comes by to read your meter, they don’t reset it to zero. If you are trying to see how much power you have used during the last month or you want to compare your bill to your actual meter reading, you need to have two separate readings. By subtracting the first reading from the most recent reading you will be able to figure out how much power you used that billing cycle.